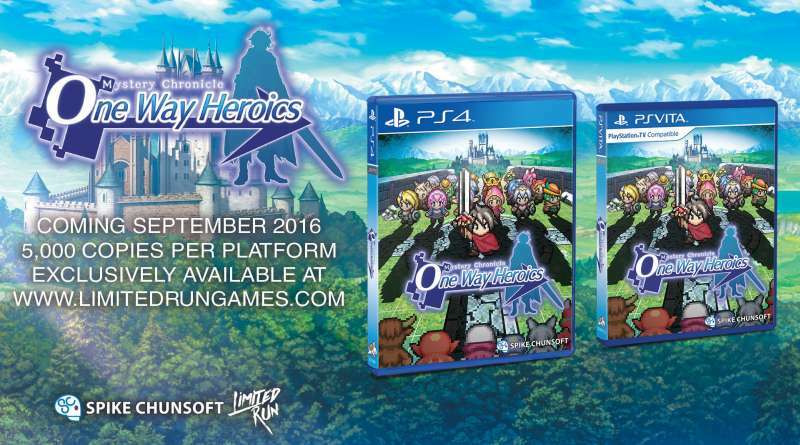 Limited Run Games has announced that it is teaming up with Spike Chunsoft to release limited physical editions of Mystery Chronicle: One Way Heroics for the PS Vita and PS4. The publisher revealed that a limited number of 5,000 PS Vita and 5,000 PS4 copies will be available in September 2016 exclusively at Limited Run Games. Mystery Chronicle: One Way Heroics is a 2D side-scrolling roguelike RPG where you explore an infinite number of procedurally generated worlds, each with their own terrain, traps and treasure. With over 20 classes to choose from, no two adventures will ever be the same.